Selecting a horse bit doesn't have to be overwhelming. Start with a gentle bit and adjust according to your horse’s job and training level, and to rider expertise. Your primary considerations are that the width of the bit is appropriate for the inside of your horse’s mouth and that the bit fits her lengthwise. The two bit categories are snaffle and curb -- or leverage and non-leverage. The main distinction is that you attach the reins directly to the rings on the mouthpiece of a snaffle, whereas with a curb bit you attach the reins to a ring that is lower than the mouthpiece, on a shank. The longer the shank, the more pressure your horse feels when you pull the reins. Most snaffle bits are jointed bits, with one or more joints in the middle so the bit bends in the mouth in response to rein pressure, but some snaffle bits have non-jointed mouthpieces. In addition to leverage or non-leverage design, other distinctions to consider -- ranging from negligible to more significant -- include bit width, mouthpiece type, ring type, curb chain and mouthpiece material. A wider bit is typically more gentle than a narrow one as long as your horse’s mouth is large enough for it; a smooth, jointed bit is more gentle on a horse’s mouth than a twisted, wire or non-jointed one. Loose rings allow the mouthpiece to lay in the mouth more naturally than fixed rings; a curb chain adds additional pressure to the bars of your horse’s mouth. Regarding bit material, you may discover your horse prefers a certain type, such as apple-flavored rubber instead of stainless steel. As long as the bit fits your horse both inside and outside her mouth, or is extremely sensitive, you can typically interchange non-leverage bits easily. Your main concern, other than fit, is to ensure the rider’s experience is suited to the bit. For example, if your horse responds better to a narrower bit but your rider constantly pulls hard on the reins, a good-natured horse eventually becomes hardened or immune to this pressure. She becomes “hard-mouthed,” requiring more and more pressure to get the response you want. 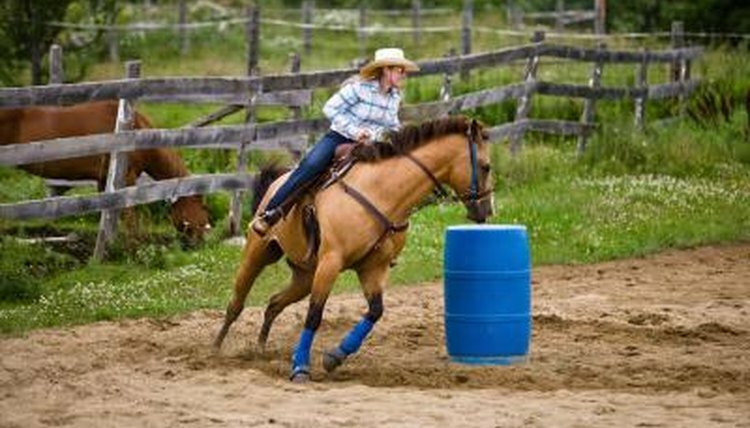 An ill-natured horse will likely either balk or attempt to throw the rider. Your main concern when interchanging leverage bits is the mouthpiece and shank combination. If your horse is used to a Western, short-shanked, non-jointed bit with a low port -- the upper indentation to relieve your horse’s tongue -- and you put her in a jointed, long-shanked bit, she may balk at the considerable pressure now being exerted on both her bars by the jointed mouthpiece and on her poll by the longer shank. On the other hand, if you are retraining a Western horse to ride English or to show her in both Western pleasure and English jumping events, exchanging her short Western shank bit for a similarly short two-ring jointed snaffle is a fairly innocuous change. Some competitions in certain disciplines prohibit some types of bits. What Type of Bit Do I Use on a Barrel Horse? What Are Half Cheek Bits? What Is a Cutback Saddle?